with sustainable materials on page 16.
the increasingly pressing issue of water scarcity. WATER Closely linked to the issue of climate change, is A lot of water can be saved through improved operation with Cotton Made in Africa on page 38.
united in formulating goals for a better future. more about how we address the goals on page 8. Nilorn operations, unless otherwise stated, in relation to the reporting of specific indicators from our sites. Report can be found at our corporate website. what we do. We work hard to take care of each other and ensure that our workplaces enable people to grow, in their knowledge, skills and as people. are developed and refined. Therefore, in 2018 we joined MinShed, a project aimed at ­increasing the awareness around textile materials and specifically around the issue of synthetic fibres and microplastics. and certifications of our production sites, as environmental and social labels help us build trust. Our newest site in Dhaka has increased its production in 2018 and is now both OEKO-TEX and FSC certified. clients and suppliers. Every piece of that puzzle matters. We now have a new d ­ istribution centre in Germany, serving the majority of our distribution in ­Europe, enabling us to work more efficiently with transport. In 2019 we will ­focus on identifying transport impacts, increase our focus on ­alternative ways to meet to minimise business travel and we are investing in solar panels to supply our site in Portugal with renewable energy. and tailor-made concepts in the areas of branding, design, product development and logistic solutions. Nilorn’s head office is located in Borås, Sweden, and our clients are principally from the ready-to-wear fashion sector. We have a production network of both own units and external partners. international markets. Nilorn’s mission can be summarised as “Adding value to your brand”. ­recognise our responsibility to respect international standards and practices. We have developed a number of internal policies to support our vision and values. potential negative impacts on people and the ­environment. gate adverse indirect human rights impacts that may be linked to our operations, products and services through business relationships. in taking a holistic approach - including the entire design, manufacturing and supply chain. the organisation, to spread knowledge and share ­experience. production, purchasing, sales and CSR. 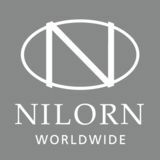 ­sourcing countries we coordinate Nilorn’s sustainability work. of our strategy, culture and day-to-day operations. also e ­ xpected to comply with national and other ­applicable law and not be involved in any act of ­corruption, extortion or embezzlement, nor in any form of bribery. Read more about our work to ­implement the Code of Conduct on page 22. ANTI-CORRUPTION POLICY Our Anti-corruption Policy contains the organisation’s mandatory rules and restrictions regarding gifts and other kind of appreciations. It also describes the procedures for employees to raise any ethical questions or to report any breaches or suspected breaches of the company’s code of conduct. Read more about our work to implement business ethics on page 30. HUMAN RESOURCE POLICY Our Human Resource Policy regulates what the company expects of its employees and what employees expect of the company. The HR policy mainly regulates: management responsibility for developing its staff, information supplied to all employees, annual performance reviews, payments and IT usage. The overall objective is that work on gender equality should be a natural and integral part of all our activities and it applies to all staff and levels. Read more about our work to implement business ethics on page 30. The UN Sustainable Development Goals We deliver our products to more than 65 countries around the world and are thus part of far reaching value chains. We feel that such a global presence calls for global responsible actions. Since 2017, Nilorn have been signatories to the UN Global Compact. The Ten Principles of the UN Global Compact defines the foundation on which our business must stand. partnership and co-operation is needed to ­achieve the goals. across the social, environmental and economic dimensions. Africa and the Swerea Chemical group. where we can contribute positively. ­relation to the sustainable development goals and their targets. municated their most material challenges and o ­ pportunities. goals and their sub-targets are of p ­ articular relevance. require water and ensuring proper waste water ­treatment. ­engagement with MinShed and Cotton made in Africa. certifications and include certification schemes used by suppliers in our criteria for choice of suppliers. across the entire chain of production. MinShed and The Hong Kong Business-School Partnership Programme (read more on page 40). felt - combined with a small part in grained Jacron – a rather unusual material choice for branding a pair of jeans. “I have high hopes for the future. the most prestigious design competitions worldwide and have an excellent reputation far beyond specialist circles. Ensuring that the ambitions of the client and our own knowledge, result in products that have as low environmental impact as possible, to be resource-efficient. Product development is present locally, close to production. Access to our own manufacturing creates advantages for product development and sampling. Making more detailed decisions on choice of materials to which factories to place orders etc. We have an important role in giving our clients options to choose more sustainable solutions and consider end-of-life options. This is an area where we as a company have a really large impact. Nilorn has design teams in several countries, to work closely with the clients and to make the right choices early in the process. the supplier, the workers and their families. Discussing choice of materials and its ­implications on sustainability with our client. It is important to already highlight at this first stage the sustainability focus. By working close to our client’s ­production s­ ites, we can minimise distances and t­ herefore transport emissions. As ­transportation is often decided by the client, we have less influence. We are focusing on degree of fill rate and joint loading to create cost-efficient transportation solutions. Our products are a part of other products, so our key role in this area of the chain is to deliver a ­correct product promptly, in order to not cause delays, which in turn could have negative consequences both from an environmental and worker p ­ erspective. The manufacturing of the clients’ products is an area where we at Nilorn have less impact. Design for less waste and with more possibilities for re-use and recycling of the products. Also focusing on responsible waste handling in ­production, encouraging recycling of materials. We can help our clients to reach out to the consumer with messages concerning labelling of products and, in general, help increase the transparency and traceability of products. This can also help the consumers to make more conscious choices. better all round, not only from the product perspective. ­performance, having the best score in five ­categories. processes, choosing a supplier, planning the logistics etc. to be able to progress making the business more sustainable. us a confirmation that our focus on sustainability is necessary to be part of these brand’s supply chains. This checklist has been prepared by the Nilorn design department. To be used as a tool in new product developments. • Does this product serve its purpose? Is it functional? • Could we use certified materials? • Is the material suitable for this product? • Will it last long enough? • It is able to have a second use? • Will it age with beauty? • Could it be reduced/minimalised/simplified? • Can the design be optimised to reduce product waste? Today, many people strive for a more circular behaviour to reduce litter and climate footprint - we also see this interest from many of our clients. To a greater extent using “more green” material is high on the agenda. made of corozo and vegan leather, to name a few. when it comes to design for recyclability. needed to make recycling easier. manually, an expensive and time-consuming process. tonnes of waste are recycled across the world each year. things when we do not know what it contains. MICROPLASTICS In recent years there has been large focus on the micro-sized particles of plastics - so called microplastics - and the number of negative consequences for humans and the natural ­ environment they have. Protecting the ­marine environment from the potential impact of microplastics is a critical issue. Our products are often made of synthetic fibres such as polyester and polypropylene. Synthetic fibres come off during washing and follow the water out of the washing machine. Most water treatment plants are not ­effectively filtering out these particles and they are passed on into our watercourses. We therefore joined the MinShed project to be able to contribute and learn. MinShed is a three-year research project. The goal of the project is to create knowledge and guidelines which will help the textile industry to design and create clothes made of synthetic fabrics which do not emit microplastics. The project will also investigate how washing machines are designed and whether or not they can be equipped with a filter that can reduce the emissions of microplastics. RFID – what is it? RFID is short for Radio Frequency Identification. The technology is based on wireless communication, using electromagnetic fields for the transfer of data that is electronically stored on tags attached to a product. The electronically-stored information can be accessed by a reader when it is ­ operated within the range of the tag. RFID also ­allows ­communication between a brand and the end-user by use of an NFC (Near Field ­Communication) enabled smartphone. In 2018, Stora Enso launched a new RFID tag ­technology called ECO™. The technology enables the RFID tags to be produced on a 100% ­fibre-based paper label, unlike traditional plastic tags, ­resulting in a lower carbon footprint. The ECO tag can be recycled in an environmentally-friendly way, ­together with paper and board materials. Brands are proud of their product developments and, naturally, want to protect them. To support them, we produce and ­deliver a number of successful secure techniques. UV-yarn, UV-printed holographic yarn, holograms, sequential ­numbering, watermarks, QR-codes, Nilorn secure and radio frequencies are just some examples of methods that can be applied, to protect the clients’ products. At Nilorn we had already started looking into RFID in 2010.
inventory management and product tracking solutions. gradual roll-out to full scale. Production and Supply Chain Nilorn is strategically located in major manufacturing countries around the world, enabling shorter delivery times, lower freight costs and reduced environmental impact. Most of our production is through external suppliers as it allows us to be flexible and adapt to our clients’ locations. Our own production is an important complement. With this combined approach, we can ensure timely deliveries and high quality. ­Portugal factory we are now using energy from ­hydropower. ­options to increase with the goal to reach 100% by 2021. ­production is to replace standard lighting with LED lighting. Investing in renewable energy We work to enhance energy efficiency and increase the use of renewable energy. The factory in Nilorn Portugal is since July 2018 using 100% renewable energy from hydro power and now taking further steps and installing solar panels. within the Nilorn group that uses the most energy, will install 460 solar panels at the beginning of 2019. Responsible supply chain management Companies today are getting called upon from stakeholders to take responsible action in various areas, especially in the supply chain. Nilorn is no exception. We conduct a variety of CSR-related activities and, through our supply chain, urge suppliers to do the same, with the goal of a fully compliant supply chain and achieving sustainability in society. and is an internationally recognised code of labour practice. The ETI Base Code is built around nine Principles. ­visibility, improved communication and buying power. years. A stronger relationship equals a better partner. steps we are taking to mitigate the risk of modern slavery ­occurring in the supply chain and business operations. The statement is published on the Nilorn website. It reflects our zero tolerance approach to modern slavery in any form and the different forms of modern slavery are covered by the focus areas of our supply chain audits. determine the policy of its members. Sedex provides a place to store any and all ethical audit reports, with a summary of non-compliances held in a common format. chain, relevant local laws, environmental ­ performance, ­subcontractors/home workers, eligibility to work and ­understanding of the ETI base code. WHAT HAPPENS DURING A SMETA AUDIT? Sedex platform, this will also reduce administration. our own companies and a network of strategic partners. ­Karachi, Keighley, New Delhi, Recarei and ­Shanghai. re-use and recycling across our office and production locations. ­water used in production and look at our global water usage. factory in an environmental screening process. conducted at our suppliers’ sites. Nilorn participates in the Chemicals Group at Swerea IVF. ­environment and human health, to its member ­companies. our nominated partner for physical and chemical testing. and Restricted Substances List are complied with. This is a ­non-negotiable requirement. California Proposition being two of them. the environment. Businesses are required to provide a ‘clear and ­reasonable’ warning before knowingly and i­ntentionally exposing anyone to a listed chemical, unless the ­business can show that the anticipated exposure level will not pose a significant risk of cancer or is ­significantly below levels observed to cause birth defects or other reproductive harm. Currently, the ­California ­Proposition 65 list of chemicals has grown to more than 900 chemicals and will continue to expand as new chemicals are added. At Nilorn we see a growth in our packaging product range. In 2017, Isabel Ip joined us as Senior Product Development Executive, with a background in the packaging field. Later, in 2018, Peter Collins joined as the Group Packaging Manager. ­problematic i­ ssues - always with the clients’ needs in mind. the challenges at the moment. ­together in a more sustainable direction” Peter adds. have good possibilities to meet consumer demands for ­paper-based material” says Peter. “We only have one planet. It is as simple as that” says Isabel. still at a competitive price. to reduce use of non-recyclable plastics and facilitate r­ ecycling. ­packaging products will be the key to our success. â&#x20AC;&#x153;Clients are increasingly aware of their usage of packaging materials and the potential damage those may cause once they enter the waste streams. 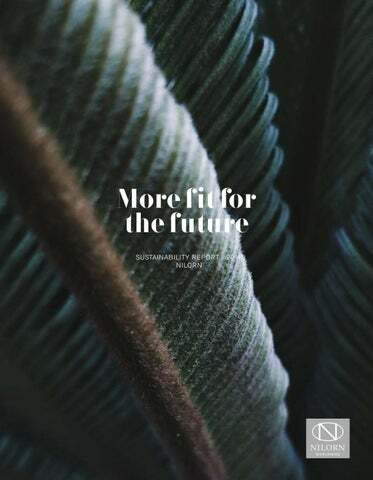 With the advent of greater environmental concerns from clients our challenge will be to offer more sustainable alternatives, reducing footprints, whilst maintaining an aesthetically and commercially pleasing solutionâ&#x20AC;? employees to enjoy a long career with Nilorn. we need to offer an excellent work ­environment. more on, as well as training in the CSR and ­sustainability field. ­employees are offered a­ nnual performance reviews. will be an updated and more detailed ­introduction to CSR and sustainability added to the program. 9% in 2018. This growth is due principally to recruitment in ­Bangladesh and Hong Kong. * Absenteeism is tracked locally in accordance with regulations applicable in the different countries where Nilonr operates. The Company does not have a ­harmonised system for managing absenteeism throughout its subsidiaries. Business Conduct The core values are the practices a Nilorn employee should be guided by daily, in all work situations. They form a common platform and strengthen our teamwork. Together with our Code of Conduct and other ethical guidelines, they guide how we conduct our business and clearly show what we stand for as a company. Travel Nilorn is operating in many parts of the world. Business travel is one of our largest sources of emissions, and air travel generates more emissions per kilometre travelled than any other mode of transport. of our business travels. In 2018 we decided to ­compensate for the emissions caused by our yearly sales conference. online meetings facilities. New means of travelling also electrical cars installed in Nilorn Sweden. Villa Nilorn After 2010 when the main production units was centered to Hilden, Germany. The Belgian office, resulted in less ­employees and the need for a smaller workplace. Three years ago the team in Nilorn Belgium have found themselves a nice, homely office at ‘Villa Nilorn’. and machines being moved to other Nilorn production units. Brussels and Antwerp - exactly what Bart was looking for. From 2010 onwards, the main stock location for Europa was Hilden, Germany. as offices, it was most definitely not just a standard office. company, offering a wide variety of products and services. of occasions for collective activities amongst the colleagues. offices, to warmer and more homely workplaces. There is the yearly Christmas dinner, the company trip to music festival Tomorrowland and the Nilorn summer party. â&#x20AC;&#x153;Not only do the new desks fit our old villa perfectly, but also we created a better working environment with less environmental impactâ&#x20AC;? from the existing desks will be re-used by a local carpenter and transformed into furniture for the office. message, they can also be a certified product in themselves. produced in an environmentally sound manner. 2018 we added GOTS to our range of certified products. certificates, in the form of unannounced inspections. 1 is the h ­ ighest level. environmental impact and appendix 6 is one of those ways. Miljömärkning Sverige, Gröna märkningar – en djungel? The bluesign® system puts the whole production chain in focus. It has focus both on the product itself in terms of sound materials but also the chain of production - from raw materials to finished products. — The certification covers: resource, productivity, consumer safety, water emissions, air emissions, occupational health and safety. As of 2013, the Nilorn group is a bluesign® system partner. textile accessories and the article range ‘printed care labels’. and water and energy consumption. and an action plan with necessary measures are drawn up. safety and an overall improvement in house-keeping. party and the GRS is used to verify the recycled content of products and also includes responsible social, e­ nvironmental and chemical practices in the production. it is of course not only the choice of materials that affect it. ­Design, production, waste and transport are all important traceability and ­origin. materials and this is an important part in our aim to work products are polyester, paper and plastics. ­hazardous chemicals, and child labour, while requiring strong social compliance management systems and strict waste water treatment practices. We are able to deliver GOTS certified printed cotton ribbons and labels. meet social, economic and ecological needs. Our FSC chain of custody certification provides a framework to promote ­responsible forest management. the same trend in the production of FSC labelled ­products produced at external production units, but this statistic we are not able to follow with our current business system. â&#x20AC;&#x153;Every piece of textile that bears the CmiA label is a step in the right direction. Because every CmiAlabelled product protects the environment and supports millions of people in Africa in creating a new perspective for themselves in their home countriesâ&#x20AC;? Cotton made in Africa (CmiA) is an Aid by Trade Foundation initiative and an internationally recognised standard for sustainable cotton from Africa. Since its creation by Dr. Michael Otto in 2005, CmiA has set itself the goal to protect the environment and help Sub-Saharan African smallholder cotton farmers and ginnery workers, to improve their living and working conditions. To put this aim into practice, an alliance of international textile companies and brands built up by CmiA, purchase the CmiA certified sustainable cotton, integrate it into their respective textile value chains and pay a license fee to the foundation to use the seal. cotton ginneries are currently part of the CmiA program. e.g. to ­support elderly ­people or orphan children. Coast, Mozambique, Zambia, Tanzania and Uganda. place during the visit, together with producers and retailers. of 14% compared with 2017. ­sector and schools. It leads students out of the classroom get ­ prepared for life in society. ­members. Nilorn East Asia has been a member since 2017.
in Australia. Nilorn became a member in 2018. ­Corporate Social Responsibility (CSR) programme at ­Nilorn. means. Noting that CSR is a key part of Nilorns operating ­philosophy, I hope to work at a company which values CSR when I graduate”. ­regulations and i­nformation, such as customs duties, rules of origin, free trade agreements and CSR. Nilorn has been a member ­since 2004 and our Sustainability Manager has been a board m ­ ember since 2017.
business and industry in the UK and throughout the world. Nilorn participates in this group. ­information, export advice and networking. Stakeholders We take part in many stakeholder groups in a variety of settings across the Nilorn organisation. Commitment to ongoing stakeholder engagement is a core component in our sustainability strategy. We aim to have an open communication, to listen and to learn from others and it is necessary to allow all groups to co-operate for a more sustainable industry. We want to provide stakeholders with relevant and comprehensive sustainability reports. Sustainability risks Nilorn’s risk management approach follows our decentralised structure and the same applies to our sustainability risks. All managers at Nilorn with operational responsibilities are expected to ensure that risks associated with their operations are appropriately identified, evaluated and managed. Risks that legal and regulatory requirements are not met Risk of corruption, especially in high-risk countries. Negative reputaional and/or financial impact. Nilorn has a group governance framwork and compliance include anti-bribery and corruption policy. Establish appropriate procedures, monotoring and reporting to prevent violation of laws, corruption or handling of personal data. 3rd party social audit at own p ­ roduction units. Training of staff. Injuries or workrelated sickness at Nilorn own production sites or at supplier sites. Fatal accidents, serious injuries or long-term absenteeism at production sites. Risk of legal and financial conseqences if OHS has been managed poorly. Risk that employees find the work environment unsatisfactory, resulting in difficulties to retain and recruit. Reputational risk if poor safety conditions exist in the company,resulting in damage to our brand. 3rd party social audit at own production units. Continue to build a common H&S culture and effective management systems. Managing increased demand of more environmentally conscious products by our clients. Increased demand to understand climate change effect on both internal and external operations. Use of chemicals in production process. Risk of loosing clients. Not being able to meet clients’ ­expectations on our operations and/or ­products with regards to ­environmental performance and new materials. Risk of problems with supply due to climate related incidents. Risk of soil and water contamination. Focus on improved efficiency to minimize environmental impact in our own operations and in supply chain, bluesign certification being one method. Keep high awareness of new regulations and market demands. Apply framework for handling chemicals adapted to EU legislation Reach and apply Nilorn Restricted Substance list. Risk of suppliers not ­complying with the Supplier Code of ­Conduct and not following ­national laws and regulations. Negative reputation and risk that we do not live up to the ­requirements of our clients. Delays in delivery and increased costs. Continue to build strong supplier relationships. Increase awareness of Code of Conduct, environmental requirements and other policies. Own and 3rd party audits of suppliers. ­Consolidate and focus on ­preferred suppliers. to collecting e­ nvironmental data from our sites. everything that we do, today and going forward.” Anna-Karin Wårfors, Sustainability Manager. * With our FSC certificate for Nilorn East Asia and Nilorn Shanghai we report the delivered quantities to the FSC Secretariat. We see the same trend in the production of FSC labelled products produced at external production units, but this statistic we are not able to follow with our current business system.